It’s finished! 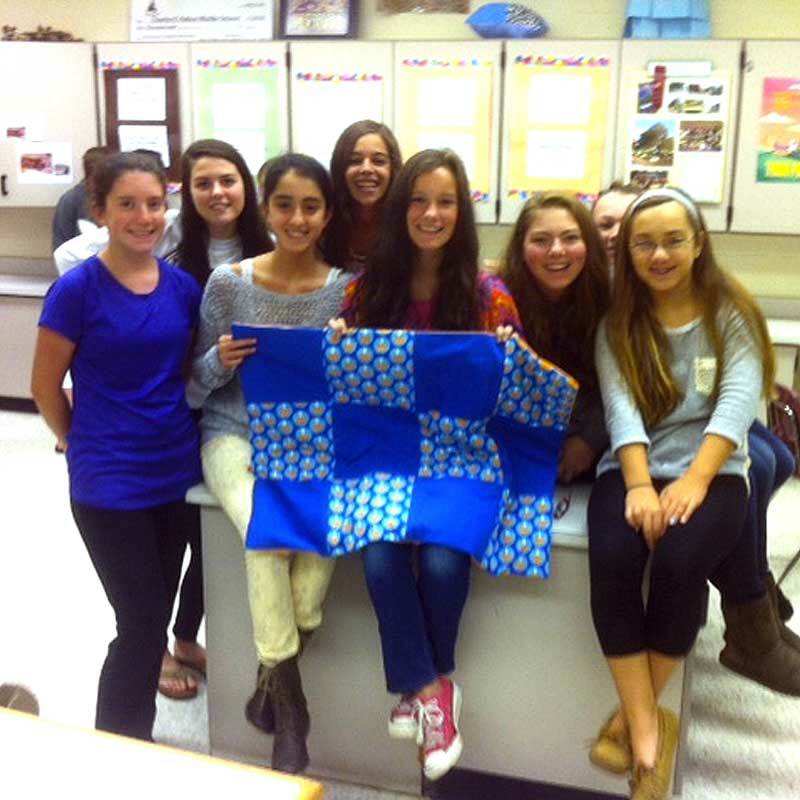 Patton students (left to right) Rebecca Peakes, Taryn Thompson, Leah Narun, Sophia Kolliopoulos, Helen Nichols, Lara Jensen, Ariana Birney, and Natalie Pechin proudly show off their completed quilt as part of the Patton Project. The quilt will be given to a child at A.I. duPont Hospital for Children. EAST MARLBOROUGH – Three years ago, Family Consumer Science Teachers Betsy Ballard and Kim Hisler’s vision of incorporating service into the curriculum at Patton Middle School became a reality. The Patton Project was born – a branch of the Family Consumer Science (FCS) course offered to eighth graders at Patton Middle School in the Unionville-Chadds Ford School District. Through the project, students literally have a hand in feeding the hungry in Chester County and comforting sick children at A.I. duPont Hospital for Children in Wilmington. The project began in 2010 with the construction of 16 raised garden beds on the middle school property. Educational grant money was used to fund the project along with the FCS teachers raising funds and seeking support from local businesses such as the Chester County Food Bank and Patton’s Parent Teacher Organization. 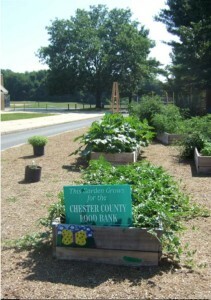 The beds were built by the students with the help of Chester County Food Bank staff members. 30 raised garden beds contain a variety of vegetables which are donated to the Chester County Food Bank and also used in the Family and Consumer Science classrooms. “Students built the beds, filled them with dirt, added compost, and planted,” says Ballard. “All grade levels were involved. Our special education students helped too. We all worked together,” adds Ballard. The number of garden beds has grown from 16 to 30 with students spending up to four hours per week harvesting and maintaining the crops. 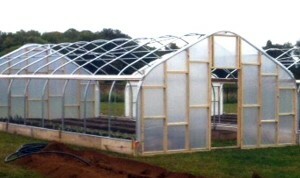 In 2011, a greenhouse was added offering new options for planting and extending the growing season. In June of 2013 a pergola, built by Unionville High School Technology Education students in conjunction with the FCS faculty, was erected at the front of the school property as an area for outdoor instruction. Grape vines were planted on the pergola which will soon be sprouting grapes as well as providing shade. 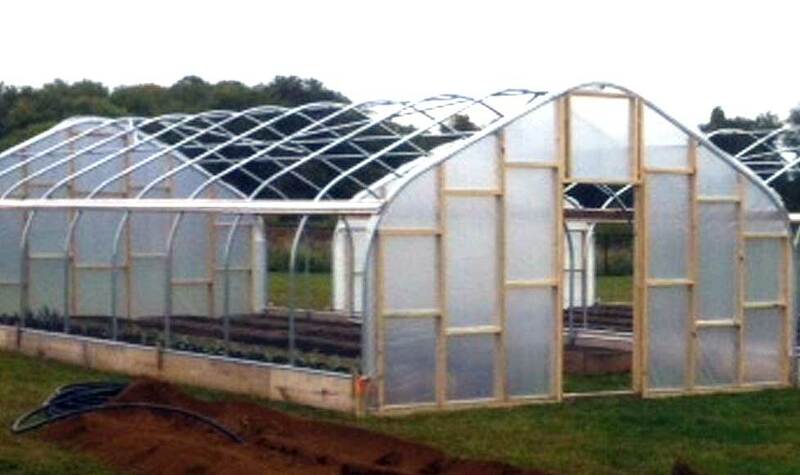 This year, the program continues to expand with the construction of two 30 foot long high tunnels, donated by the Chester County Food Bank, each containing three additional garden beds. The tunnels, or unheated greenhouses, will aid in crop production by extending the cropping season. This will allow students to grow cool weather crops which will increase the potential of growing food eleven months out of the year. Two 30 foot high tunnels are located on the school property to grow cool weather crops providing the potential to grow food 11 months out of the year. In addition, solar panels, donated by Tri-M, will soon be installed in the garden area. In the future, Ballard and Hisler also hope to obtain rain barrels too. The goal is to provide an environmentally friendly way to conserve electricity and water. Just how impactful has the Patton Project been to the local community? Over 2,500 pounds of food have been grown and donated to the Chester County Food Bank since the program’s inception. A small portion of the food is also used in the FCS classrooms. 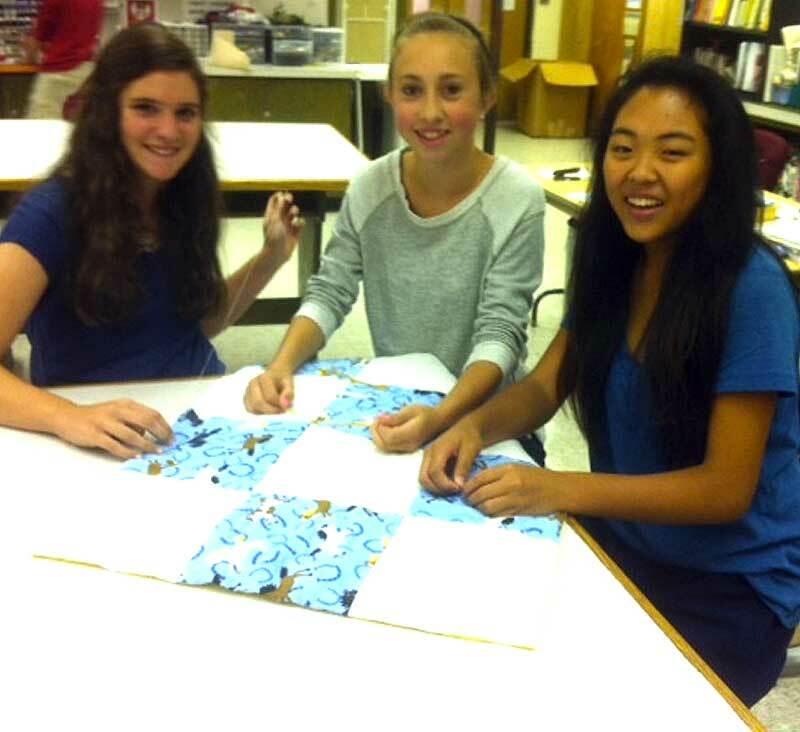 Patton students (left to right) Madyson McDougal, Rachel Ioele, and Cara Freedman work on a quilt to be donated to sick children at A.I. duPont Hospital. While the students are busy planting and weeding, it’s not uncommon to find them also sampling the fruits of their labor. “We grow everything,” says Hisler. This including tomatoes, radishes, asparagus, lettuce, carrots, string beans, figs and herbs… just to name a few. The program also continues through the summer months through the Adopt-A- Bed Program where families residing in the district maintain the garden beds during the summer. “Many families enjoy collecting the harvest with their kids and bringing it directly to the Food Bank. It’s a way to come full circle,” Ballard adds. Besides feeding those in need, Patton students provide comfort for sick children at A.I. duPont Hospital for Children. In FCS class, students sew baby blankets, quilts, and pillowcases. Others craft cards offering words of encouragement to kids spending their days in the hospital. Over 50 pillowcases and 30 quilts have been donated to children at A.I duPont., many of which are handed directly from doctor to patient with well wishes from the students at Patton.